It’s that time of year when many of us are making New Year resolutions – but there’s one resolution that could do more for your wellbeing than you might think. Borrowing a book (or two) from your local library! According to research, reading is the best way to relax and even six minutes can be enough to reduce your stress levels by more than two thirds. It really doesn't matter what book you read, by losing yourself in a thoroughly engrossing book you can escape from the worries and stresses of the everyday world. Not sure what to read? Our libraries have lots to inspire readers and you can find out what’s new on the library catalogue. And this month even more of Norfolk’s libraries will be offering extended opening hours giving customers access to their local library seven days a week. New adult fiction titles out in January include Believe Me by JP Delaney, Whistle in the Dark by Emma Healey, Watching You by Lisa Jewell, The Blood Road by Stuart MacBride, Day of the Dead by Nicci French, Leverage in Death by J D Robb, The Devil’s Dice by Roz Watkins, The Girl from the Docklands Café by June Tate and A Place to Call Home by Val Wood. To see more new adult fiction titles visit the library catalogue. Do you fancy a free family pass to Hunstanton 2019 Panto? The Mobile libraries and the Princess Theatre, Hunstanton, are teaming up to offer some lucky Mobile library customers a free family ticket to the 2019 panto. Simply take your children to a Mobile library to collect a panto-picture to colour in. 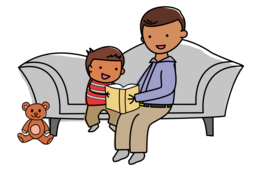 Return the completed picture to a Mobile library, including your child’s name, age, borrower number, and your contact details, by 30 August. Each driver will choose a favourite who will win a family ticket each. Winning entries will then be sent to the theatre, and they will choose their favourite. Alongside the family ticket, this person will win, a limo to take them to and from the theatre, some complimentary champagne for the adults and soft drinks for the children. Visit Gaywood library on Thursday 10 January, 10:00 - 12:00, and learn how to make small novelty gift boxes. All materials provided and refreshments available. Booking is essential and this event costs £2 per person. For more information or to book please call 01553 768498. On Wednesday 16 January, 10:30, Peter Lawrence will deliver a talk at Aylsham library using his own collection of vintage postcards showing pictures from London, Essex and the Norfolk Broads. This talk will offer a unique look into our social and community history. Tickets cost £3.50 (including refreshments). On Saturday 26 January, 10:30 - 12:00, come along and join the Friends of Hunstanton library in designing and writing postcards for the housebound and isolated. All cards are sent via West Norfolk Befrienders. Refreshments will be provided. Calling all adults who are new to reading. Come and join our read aloud sessions at King's Lynn library and discover a world of great books that you can try. Each week you'll be introduced to a different type of writing, and meet other adults who are new to reading over a cuppa and a biscuit. Sessions are free and perfect for those who have completed the Norfolk Reading Pathway. The course begins on Friday 18 January, 10:30 - 12:00, and runs for six weeks. If you'd like to take part, please speak to library staff to book a place, call the library on 01553 761393 or email nrp@norfolk.gov.uk. Join us at Fakenham library for an informal opportunity to develop drawing and watercolour skills with local tutor Sara Dyson taking place on 24 and 31 January and 7 and 14 February, 13:00 - 14:30. Please bring your own materials and refreshments. There is a suggested donation of £5 for this event. Booking is essential, to book please call the library on 01328 862715. Join us at the Heritage Centre on Tuesday 15th January, 13:00 - 14:00, for our free heritage hour: Snapdragons and Story Books – in Conversation with Isabelle King. Picture: a theatrical group performs in Norwich, featuring the singer Gertrude Crotch. On Sunday 20 January, 14:30 - 15:45, our free heritage Sunday will be on the theme of: All the World's a Stage. Join us in the Early Years Children's library to celebrate Norfolk’s theatrical past with creative, family-friendly activities inspired by rarely-seen archive items. This event is suitable for accompanied children aged 4 - 11. From researching your family tree, to discovering your house history, on Thursday 31 January, 10:30 - 12:30, we will be running a free session to help you discover what resources the Heritage Centre has to offer. For more information on upcoming events visit our eventbrite website or contact the Heritage Centre by calling 01603 774740 or via email. And don't forget to check out the Norfolk Heritage Centre Podcast. You can also book a free 30 minute research advice session with our archive specialists from the Norfolk Record Office. Codable caterpillars, microbit unicorns, stop motion animation and mini robots - just some of the exciting events coming to all Norfolk libraries in February 2019 as part of DigiFest - a celebration of all things digital. This family-friendly event will include free workshops to help children explore creative technologies and will include simple computer coding, creating works of art with Scribble Bots and making mini movies using Stop Motion Studio. Throughout February we’ll also be running a competition asking young people to design and create something fabulous using a microbit. There are 500 microbit packs that can be borrowed free of charge from Norfolk libraries. Details of all the events taking place will be available on the Norfolk libraries website. The Norfolk Makers Festival is coming to Norfolk libraries from 9 - 24 February. Free at the Forum with Fringe events at Dereham, Great Yarmouth, King’s Lynn and North Walsham libraries. This is your chance to have a go at weaving, printing, painting, knitting, sketching, crochet, crafting, spinning, sculpting, embroidery and much, much more. With clever use of social media, texts, news report and video streaming services, Searching is shown entirely through computer screens. This unusual style of film is well worth a watch, with a plot that will keep you guessing until the end. Starring Michael Caine, Ray Winstone, Michael Gambon and other big-name actors, King of Thieves tells the story of the infamous 2015 Hatton Garden safe deposit burglary. That’s not all though, other films out this month include The Happytime Murders, Upgrade, American Animals, The Little Stranger, The Nun, A Simple Favour, The Seagull, The House With a Clock in its Walls, Mile 22 and The Predator. All of these films and more will be available to borrow from Norfolk Libraries for just £2 for two nights from their day of release. For more information about our films and music service please visit our website. To find out about events at your local Library visit our website and select your nearest Library for more details. For more information on books and reading, including information on stock suggestions please visit our website.